This download includes a fully editable 24-slide PowerPoint with 21 different questions. 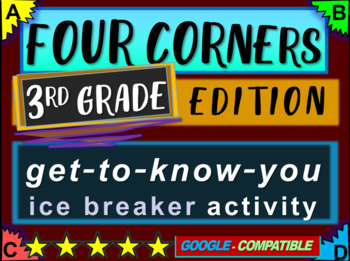 Four corners can be used in the first week of school as a get-to-know-you activity that has students up and moving around the room. The content of each question varies (favorite hobbies, different subjects, vacations, animals, sports, riddles, and much more). Students consider optional responses to a fun question, and then they walk to the corner of the room to see who else chose the same answer. 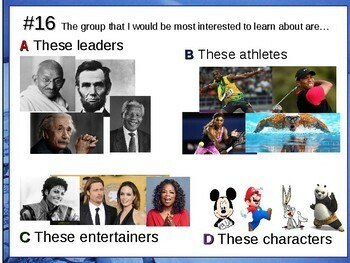 This lasts anywhere from 15-45 minutes, depending on how much discussion you want to allow between each question. Enjoy!